Book a free consultation with Rhythmitica professionals to learn more about using this platform. In this 15min session we will help you to schedual a session with Hooman Khalatbari. 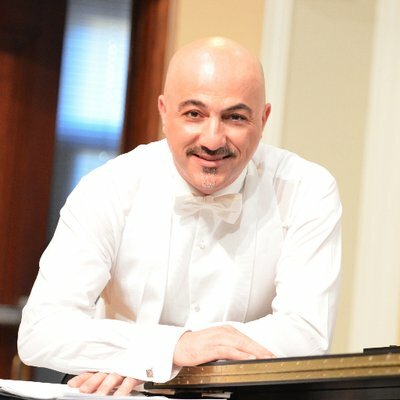 To Book a Professional Music Consultation with Hooman Khalatbari, you could book a 30min or 60min session to get in contact with him on Skype. Rhythmitica is the first Persian music online academy with professional instructors and provides Persian music online lessons. This website is powered by Rhythmitica. We set all of our times according to your local time. The Iranian-Austrian Conductor moved eventually to the front row of the young Conductors with his Sensational Substitution, since 2001 that he is the Music Director of the Opera Production of International Classic Festival at the Castle in Kirchstetten / Austria. He was Principal Conductor “The Prague Metropolitan Philharmonic Orchestra” in Prague / Czech (2014 – 2016) and since 2016 he is Honorary Conductor of “ Virtuosi Brunenses “. He is also passionate about innovative concert formats and the performance of contemporary music and appeared on TV, in CD productions and premieres of ("Schwarze Erde" by Klaus Huber/ Theater Basel, "Dry Clean Show" by Wolfgang Mitterer at the Steirischen Herbst/Graz, "Pollicino" by H.W. Henze at the Next Liberty/Graz, "Agleia Federweiss" by G. Kuehr at the Next Liberty/Graz and "Peter Pan" by W. Hiller at the Next Liberty/Graz ). Off the podium, he is sincere, warm and approachable. A natural communicator, Khalatbari is fluent in German, English and Farsi. The Young Conductor finished his study at the University of Music and Fine Arts in Graz/ Austria and graduating with honours in choir conducting and orchestral conducting. Mr. Khalatbari attended master classes given by D.Russell Davis, I.Fischer, Thomas Christian David ,Zubin Mehta, W. Bozic, A.Tamayo, R. Huber etc. From 1988 - 96 he was the assistant for the Tehran Symphonic Choir and Orchestra. From 1993 – 96 he assisted at the BCC Choir and Orchestra and the Youth Philharmonic Orchestra at the Austrian Cultural Institute in Tehran. 2001 Le Nozze Figaro (Mozart), 2002 Magic Flute (Mozart) , 2003 Don Giovanni (Mozart), 2004 Il Barbier de Sevilla (Rossini), 2005 Tosca (Verdi), 2006 Cosὶ fan tutte (Mozart), 2007 The Abduction from the Seraglio (Mozart), 2008 La Cenerentola (Rossini), 2009 La Traviata (Verdi), 2010 The Impresario / First the music and then the words (Mozart/ Salieri), 2011 The Bat(J.Strauss), 2012 Le Nozze Figaro (Mozart) , 2013 Rigoletto (Verdi), 2014 Don Giovanni (Mozart), 2015 L’elisir d’amore (Donizetti) and 2016 Don Pasquale (Donizetti), 2017 La fille de Régiment (Donizetti). He performed as a Conductor, Soloist, Chamber musician, Accompanist and coordinator in several Europa’s Cities, the USA, Canada, and Asia. His most recent performances were given as guest Conductor in Austria/ Vienna & Graz & Salzburg & Linz & Kirchstetten - Hungarian/ Budapest & Szombathely - Czech Republic/ Prague, Brno & Olomouc - Slovenian/ Maribor – France/ Paris – UK/ London - Canada/ Vancouver & Calgary and USA/ Houston, San jose, Chicago. At last in Zurich and Göteborg. Plus Music Director of “Klassik Festival Schloss Kirchstetten”, he was Principal Conductor “The Prague Metropolitan philharmonic Orchestra” in Prague / Czech (2014 – 2016) and since 2016 he is Honorary Conductor of “ Virtuosi Brunenses “. To contact with Hooman Khalatbari, please fill in this form.